Time does rush by when you're having fun. Last week a fellow in CT wanted a DVD overnighted to him so he could refer to it before butchering his turkeys for Thanksgiving. I expedited shipping for him so he had it in time. November here was a little crazy. 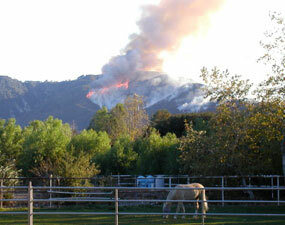 As usual for California there were many fires, including one that burned within view of our house for ten days. Watching this plume of smoke from my kitchen window, where I stand doing dishes each day, was sobering. It reminded me that there is a reason why each day is called "the present." Now it's time to put up a few Holiday lights. It's rained, and fire season is over for another year.